A poorly run meeting can be a complete waste of time, but a team can accomplish a lot in a well-run meeting. Since we spend a lot of time in meetings, how come there's no training simulation for how to run a meeting? Well, actually there is! The White Albatross game is an exercise in facilitation. i.e. leading a team! To be clear, this isn't another team building game, but a storytelling exercise for training kaizen event leaders. I suppose it can be used for general leadership training, as well. The site's a little slim on details, so I pieced together how I think it works from the two documents I found. The White Albatross exercise can be found on the government of Minnesota lean site. Currently the material is located here, but occasionally the site is updated and you may need to google to find it. In order to teach people how to lead a team, each person is supposed to take turns facilitating the group as they complete a mini-project. The project is to answer questions about a story. The story is a variation of the poem, Rime of the Ancient Mariner, about a scientist and a white albatross. This old sea superstition claims that killing a white albatross will bring bad luck. In the short story, the scientist kills an albatross and bad things happen. According to the team facilitation slide presentation, you must first complete the questions individually, then stand up and facilitate. This means leading the group through the questions and answers. Since there are only 4 sets of questions (4 rounds), I assume only 4 people can be "trained" at a time. And once the questions are completed, you can't do them again, so this is for small groups only. It's a simple story, followed by some simple true / false answers. Besides true or false, you can also answer that "the story does not contain sufficient information to respond true or false." And here is where it becomes a little interesting for the facilitator. True or false is easy, until the question becomes a little vague. One statement says, "The sailors were not disturbed when the scientist violated the old sea superstition." The story explains that the sailors protested, but the captain granted permission for the scientist to kill the albatross. Were the sailors "disturbed?" It doesn't really say, but their actions would lead you to believe so. I'm sure we're all been in meetings where the focus has been on the wrong thing, or a side conversation has diverted the whole meeting off track. Some groups could talk for hours about semantics, but a good facilitator will shut down tangential discussion. That's where this game will shine, by letting the facilitator practice sticking to the questions and key points. Especially in lean kaizen events, we want to focus on the facts and not waste time speculating on what we think something means. The game also comes with a Powerpoint presentation to help you out with your training. 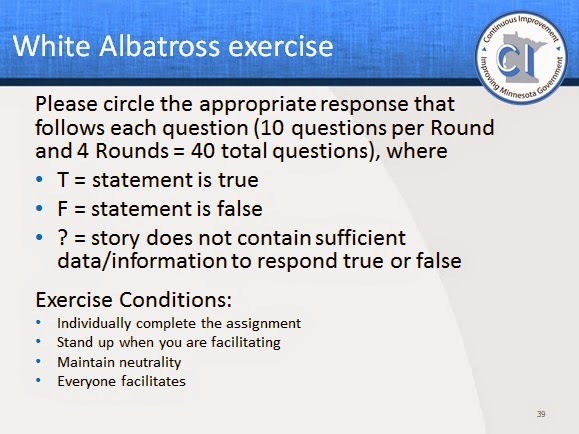 Here's the slide that mentions the White Albatross exercise. 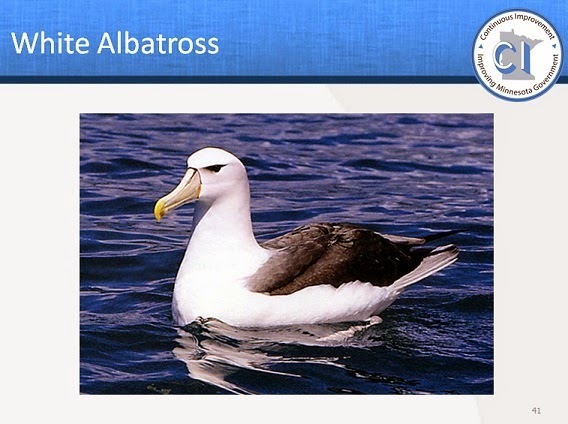 In pop culture, the term "white albatross" refers to a curse, or psychological barrier to overcome. This theme is fitting, because many people find public speaking and facilitation very stressful. The only way to get over this barrier is to just do it. The white albatross game is an excellent way to practice. 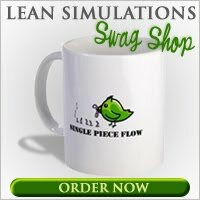 I've added the White Albatross game to my list of lean games and simulations. I will make a link in my blog to this. With this, you will conveniently download Android TV Box Reviews and install a variety of apps Best Android TV Box of 2018 as you watch smart on the internet video clips. Android TV Box It is also suitable with the most up to date Android https://penzu.com applications. It features a 2GB DDR RAM click here as well as approximately. NBA fans or tennis shoe fans will know the combo white/dark Under Armor Curry 4 shoes went on special today for $130 and are as of now sold out in many domains. The present dispatch was gone before the Curry 4 "More Magic" minor departure from Oct. 5. That adaptation will be basically sold in China, but on the other hand was accessible at select areas in a couple of U.S. urban areas. It will be hard to get a genuine match of Curry 4s throughout the following couple of weeks or months, yet in any event your character can wear them. We'll offer more reports on standard NBA 2K18 locker codes as they arrive. This one was attached to a true occasion, so its prizes may not be demonstrative of what we'll see from different codes later on. NBA 2K18 is accessible now on PS4, PS3, Xbox One, Xbox 360, Switch and PC. This locker code should work over all stages. Is it safe to say that you were ready to catch some Curry 4s in NBA 2K18? locker codes 2k18 ps4 Will you clutch that MyTeam card? Let us know in the remarks area! Pony hustling's second season – the Breeders' Cup Challenge Series and the run-up to the big showdowns of steed dashing at Churchill Downs on Nov. 2 and 3 – is in progress! That implies there's extraordinary dashing activity consistently starting now and into the foreseeable future. America's Best Racing is testing a portion of the most splendid personalities in steed wagering to think of their main three lifts for key races paving the way to the Breeders' Cup. We commenced "Enormous Race Showdown" not long ago with season one concentrating Breeders Cup 2018 Live Stream on the run-up to and through the Triple Crown. The last standings for those races can be found underneath. During the current week, the two included races are both "Win and You're In" races at Churchill Downs for the Breeders' Cup – the Fleur de Lis Handicap and Stephen Foster Handicap, which will both be communicated on NBC Sports Network! The players' picks will be posted here and a running bankroll will be kept to track their prosperity throughout the entire year. Bankrolls will be classified based on a $2 win wager on top choices and $2 exacta and $2 trifecta box wagers of every player's main three determinations. Check one week from now's Big Race Showdown to discover how the players fared in this debut round. The Melbourne Cup currently shows up helpless before the internationals this spring with 10 of the best 12 in wagering prepared in the northern half of the globe. It is Melbourne Cup 2018 Live normal the greater part the Cup field will be comprised of abroad stayers. This prompts restored banter about whether there is an excessive number of internationals in the Melbourne Cup. A proprietor, who favored namelessness, said the Melbourne spring festival has turned into an "advantage for abroad steeds and a genuine slap in the face" for all proprietors who bolster Australian hustling week in, week out. He contended there will be less motivating force to breed staying ponies in this nation when there is an expanding number of abroad prepared stayers in Melbourne each spring. The late, extraordinary Bart Cummings frequently required a top on worldwide sprinters in the Melbourne Cup albeit few upheld his view at the time. In any case, when it came to talking about dashing issues, the "Glasses King" was perpetually right. Biker, ninja, guitarist, Lucy Tania Vignelli fan and screen printer. Operating at the junction of aesthetics and sustainability to create strong, lasting and remarkable design. Let's chat. Val Adictorian Surfer, doer, record lover, Vignelli fan and product designer. Making at the intersection of design and purpose to create not just a logo, but a feeling. I sometimes make random things with friends. Biker, ninja, hiphop head, International Swiss style practitioner and TDC honorary member. Manny Petty Doing at the crossroads of aesthetics and purpose to craft delightful brand experiences. Check me out on Dribbble or Medium. Football fan, vegan, ukulelist, vintage furniture lover and AIGA member. Operating at the intersection of art and purpose to craft experiences that go Marsha Mello beyond design. I'm a designer and this is my work. Football Caire Innet fan, mother of 2, guitarist, vintage furniture lover and doodler. Acting at the junction of beauty and programing to save the world from bad design. I work with Fortune 500 companies and startups. Baseball fan, father of 3, band member, hand letterer and communicator, collector, Gio Metric connector, creator. Performing at the crossroads of aesthetics and sustainability to craft experiences both online and in real life. Let's chat. Chris P. Cream Skydiver, dreamer, hiphop head, International Swiss style practitioner and identity designer. Producing at the intersection of art and elegance to create not just a logo, but a feeling. Nothing ventured, nothing gained. Surfer, vegan, DJ, hand letterer and doodler. Making at the nexus of modernism and computer science to Paul Misunday craft experiences both online and in real life. Let's make every day A RAZZLE-DAZZLE MUSICAL.